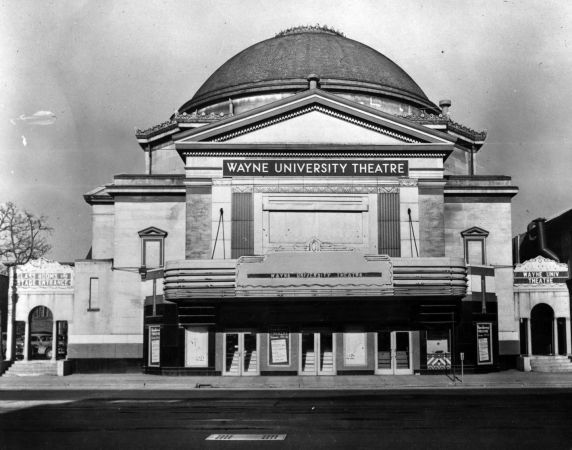 An exterior view of Wayne University’s Bonstelle Theatre, located at 3424 Woodward at the corner of Erskine, Detroit, Michigan. The building was formerly used as Temple Beth El (1902-1922), the Bonstelle Playhouse (1925-1928), the Detroit Civic Theatre (1928-1931) and the Mayfair Theatre (1933-1951). The original structure was built by Albert Kahn. Howard C. Crane oversaw the redesign of the building from a synagogue into a theatre in 1925.